Another great day and a great venue with lots of technical sections and a fair share of mechanical issues: Jens broke his saddle for the second week in a row, Brent rolled a tire, Dan had a first lap flat, and I tore my rear derailleur completely off. There's probably more, but that is all I can remember right now. With all that aside, there was some great racing going on out there. Once again Zoee Beiergrohslein dominated the Junior Women field. 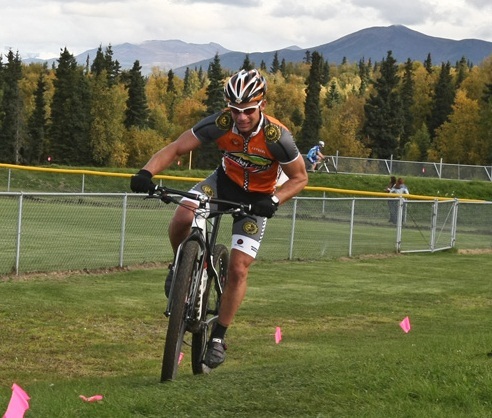 Davey Biegel came out for his first race of the year and rode away from the rest of the Junior Men field. In the Masters Women race, Margret Cunningham finished a lap ahead of the next closest competitor. The Masters Men race was a great battle with Mike Howard taking about 10 seconds on Joe Pollock each lap and finishing with a comfortable lead on Joe, who took second. The Open Women field was great today, Nylene Warner came out on top again and Kristy Smith secured second place with a great ride. The race for third was a good battle, a strong group of 4 ladies were riding together for much of the race with places changing throughout. In the end it was Eva Latosuo that put in a strong and consistent ride to come in third. The Open Men race was the biggest of the day and from the start Will Ross, Carey Grumelot, Brent Gorman and I put a gap on the field. Shortly after Carey put in the race deciding attack in the third lap, Brent rolled his tire and had to run a half lap back to the wheel pit. He grabbed a replacement and continued on, which left Will to chase alone in second place. Jeff Ellis put in a great mid-race and rode into third place while Tim Berntson and I battled for fourth until I got a pin flag caught in my derailleur and was forced to run the last half lap. I crossed the line just ahead of a somewhat despondent Brent who had managed to ride back to 6th place after his earlier problems. In the end, Carey, Will and Jeff filled the top 3 in that order.